The PBA Military and Veterans Affairs Committee and the Lebanon V.A. Medical Center partnered to help veterans at the second quarterly Legal Needs and Domestic Relations Clinic on Aug. 17, 2018. The next clinic at the Lebanon V.A. Medical Center is planned for Nov. 9, 2018. Pictured below are (front row, from left): Gabriele Miller-Wagner, PBA Pro Bono Office administrative assistant; Hannah Suhr, attorney volunteer; Lisa Grayson (Lt. Col., U.S. Army Reserve, and chair, PBA Military and Veterans’ Affairs Committee; (back row, from left) David Trevaskis, PBA Pro Bono coordinator; Sarah Primak, V.A. staff; Christina Fisher, attorney volunteer; and Stephen Sess, 2018 Penn State Dickinson Law grad and Marine Corps. veteran. Pictured below are Grayson and U.S. Army and U.S. Air Force veteran Anthony Key, one of the more than 40 veterans helped through the clinic. The Dauphin County Bar Association holds training for DCBA members free of charge to become certified to accept veterans' disability appeals cases on April 25, 2-5:30 p.m., at the DCBA, Harrisburg. Get more information from the DCBA and from PA Probono.net. The Arcadia University baseball team lost both ends of a doubleheader on April 11, but the day was still a big win for the Arcadia Student Veteran Organization (ASVO),which celebrated the Military Appreciation Baseball Game with a successful fundraiser — selling baseball hats and game-worn uniforms — and a military legal-aid clinic letting veterans know of support from the legal profession. Arcadia students and faculty, a number of whom are veterans, were joined by lawyers from the PBA Military and Veterans’ Affairs Committee. The PBA, under the auspices of President Francis X. O'Connor, has instituted the Lawyers Saluting Veterans initiative, which honors veterans by asking every lawyer in Pennsylvania to help take one case pro bono for a veteran. The PBA also provides free estate-planning documents for veterans through the Wills for Heroes (WFH) program. Looking ahead, the ASVO is planning to host a WFH program on Arcadia's campus on Sept. 12. Shown in the photo below, are, front row, left to right, Libby Miller, Bethany Hess (USMC vet), Jennifer Ashby (current Army National Guard), Lynn D'orio, Jordan Morgan (Navy vet), Arcadia University political Science Professor and group sponsor Amy Widestrom and volunteer attorney Craig Oppenheimer; back row, left to right, attorney volunteer Malcolm Murray, Alex Merker, PBA Pro Bono Coordinator David Trevaskis, Fred Zajac (Army vet) and volunteer attorney Harry Cooper. 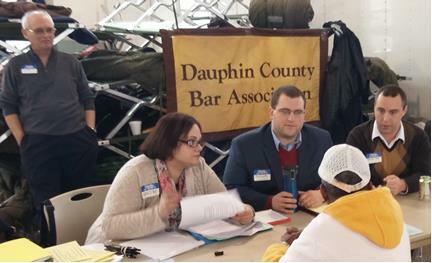 Dauphin County lawyers offered legal advice to homeless veterans at the Harrisburg Military Post on Feb. 2, 2015, as part of the Dauphin County Bar Association-supported HOMELESS VETERANS Stand Down program. Standing at left in the photo below is Jim Strupe. Seated, from left, are Karen Moyers, Joe Schwartz and Patrick Todd. U.S. Citizenship and Immigration Services (USCIS) will highlight service members, military spouses and veterans taking the Oath of Allegiance to become U.S. citizens at naturalization ceremonies in honor of Veterans Day. In all, USCIS will welcome more than 3,000 new citizens at nearly 40 naturalization ceremonies taking place across the country Nov. 7-14. Read more. Dec. 3, 2013, marked a celebration more than three years in the planning as the Dauphin County Bar Association (DCBA) unveiled its Veterans Disability Referral Service, which it created in partnership with the PBA Military and Veterans’ Affairs (MVA) Committee and the PBA Pro Bono Office. Twenty-two local lawyer recruits freshly trained in October by retired Widener Law professor Tom Reed and Harrisburg attorney Jeremiah Underhill, both MVA Committee members, are now serving veterans in the midstate region. Underhill, who ran Widener's Harrisburg Veterans Law Clinic from 2007 until its closure in 2010, had been trying to organize a successor service to help vets with appeals ever since. Under the new program, and according to government guidelines, prospective clients must have been denied VA disability benefits and be ready to appeal those refusals before attorneys in the referral program can offer help. Veterans whose incomes are at or below 125 percent of the federal poverty level will be eligible for free aid and government-set contingency fee rates will apply for less needy clients. 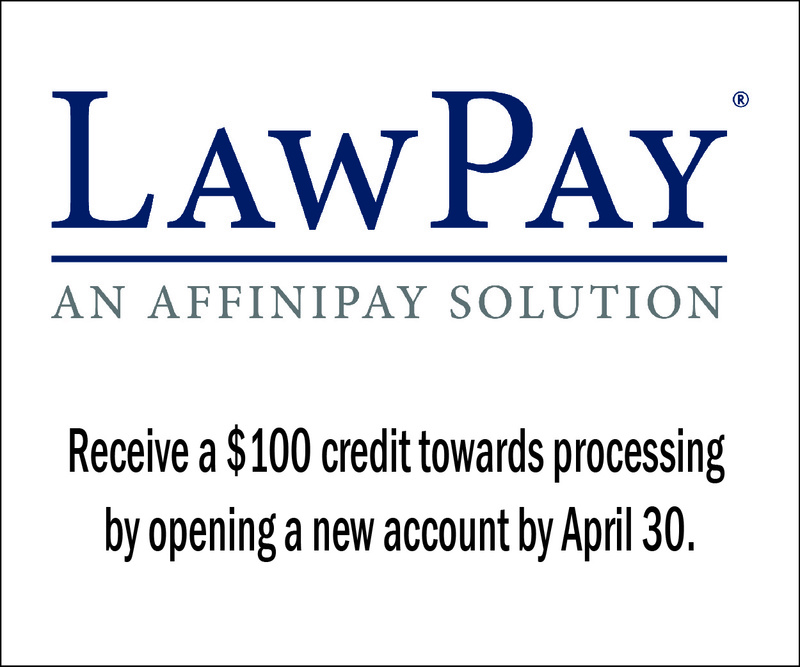 Ten percent of the income from contingency fees is to go back into the program. Underhill notes the importance of representation: "If a person has an attorney, they're 25 times more likely to get a positive outcome." Veterans in need of help and lawyers interested in joining the program can call the DCBA at 717-232-7536. Pictured below are Underhill (front, fourth from left), Dauphin County Bar Executive Liz Simcox (front, fifth from left) and other leaders of the DCBA program at a reception in honor of the program. Professor Tom Reed and Jeremiah Underhill conduct Veterans Disability Referral Service Training at the Dauphin County Bar Association, Harrisburg, on Oct. 4. Go to the county bar website for information and to register. The Pennsylvania Service Connect Team (PSC) is a new initiative developed by the federal Substance Abuse and Mental Health Services Administration to help former servicemen and servicewomen overcome difficulties in returning to civilian life. Read the announcement and invitation to the PSC's First Annual Service, Support & Resource Showcase Event, to be held Sept. 22. Come participate in the Pennsylvania Bar Institute presentation of the PBA’s Military and Veterans Affairs Committee Desktop Military Reference Training, the major training effort for the Legal Assistance to Military Personnel Pro Bono Program which has helped nearly two thousand soldiers, veterans and their families over the past decade. The training will be held all day on Flag Day, June 14, 2011, in Mechanicsburg, Pa., and sent out across the commonwealth by satellite. Join attorneys and judges who will be presenting and learning about the legal issues that impact active, guard and reserve armed forces. Additionally, the program is meant to continue to encourage statewide pro bono programs to assist our armed forces with legal matters that affect them and their families. The PBA MVA Committee has worked closely with the National Veterans Education Program out of Media, Pennsylvania, the home of the Veterans Museum, as well as with Freedoms Foundation of Valley Forge where the Medal of Honor Gardens have been rehabilitated with PBA MVA assistance. The Pennsylvania Bar Association’s Military and Veterans Affairs Committee will be featured at the National Constitution Center on Veteran’s Day as its Legal Assistance for Military Personnel Program (LAMP) helps military personnel and veteran get legal assistance shares resources during the day. Wes Payne, Chair of the Philadelphia area LAMP effort, will be available during the day to highlight the PBA’s commitment to those who serve now and have served in the past. Find out more about the day’s event. LAMP programs were started at the request of the Armed Forces with Bar Associations throughout the nation being asked to organize civilian attorney pro bono programs to provide legal assistance to deployed and mobilized military personnel and their families. The Pennsylvania Bar Association's Legal Assistance for Military Personnel (LAMP) Pro Bono Project is a program of the PBA’s Military and Veterans Affairs Committee. It connects active-duty military personnel to free legal assistance for civil legal issues beyond the scope of services provided by a military legal assistance office. LAMP is designed to help our service men and women, and veterans, make sure their legal affairs are in order and to plan for their families when active duty service personnel are absent. LAMP provides legal assistance in estate planning, employment, consumer, debtor/creditor, housing, immigration, family law and taxes. LAMP also provides assistance with Servicemembers Civil Relief Act, Uniformed Service Employment and Reemployment Rights Act and more. The PBA MVA runs the LAMP program through the PBA Pro Bono Office and is chaired by Montgomery County lawyer and retired naval Captain Cheryl L. Austin and Harrisburg attorney Laurel Hettinger Fedak. The Pennsylvania Bar Association, through its Legal Assistance for Military Personnel Program (LAMP), has been answering the call of our servicemembers and veterans since 2002 and has helped more than 2000 individuals and families during that time at no cost to those requesting aid.